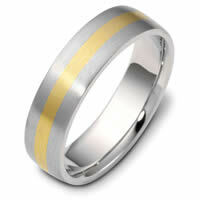 14K Tri-Color Gold Wedding Band - 14K tri-color gold, hand made, comfort fit, 4.0mm wide wedding band. 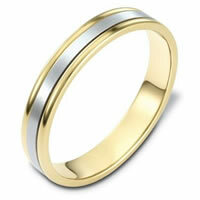 18K Gold 7.0mm Wide, Comfort Fit Wedding Band - 18 kt gold two-tone, comfort fit Wedding Band 7.0 mm wide. The ring has milgrain on each side and is completely polished. Different finishes may be selected or specified. 18K Gold, Comfort Fit, 6.0mm Wide Wedding Band - 18 kt two-tone gold 6.0 mm wide comfort fit wedding band. 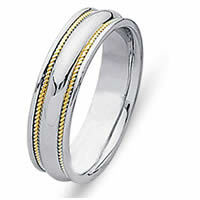 The ring is a classic style with a yellow gold stripe in the center. It is all matte finished, 6.0 mm wide and comfort fit. Different finishes may be selected or specified. 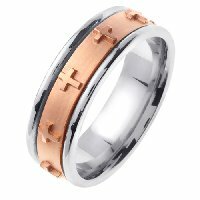 Rose and White Gold Cross Wedding Band - 18K two-tone gold, 7.0 mm wide, comfort fit wedding band. The band has crosses all the way around the center spinning band. The center of the ring is a coarse sandblast finish and the outer edges are polished. Different finishes may be selected or specified. 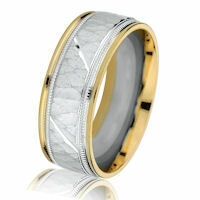 Clasic Carved Wedding Band - 18 K white and yellow gold, 10.0 mm wide, comfort fit, carved wedding band. The finish in the grooves are a coarse sandblast finish and the rest of the band is brushed. Different finishes may be selected or specified. 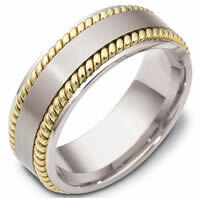 18K Men's Wedding Band - 18kt two-tone gold 6.0mm wide comfort fit wedding band. 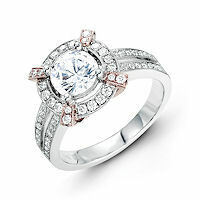 The ring has satin finish in the center and high polished at the sides. Different finishes are available. 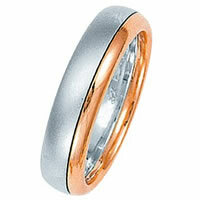 Rose-White Gold Comfort Fit Wedding Band - 18 kt rose and white gold 8.0 mm wide comfort fit wedding band. 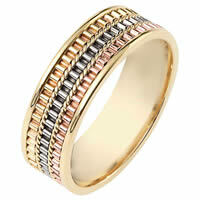 The ring is a classic style with a rose gold stripe in the band. It is all matte finish, 8.0 mm wide and comfort fit. Different finishes may be selected or specified. 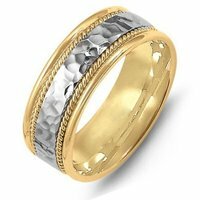 18K Gold Wedding Band Two-Tone Comfort Fit - 18 kt two-tone hand made comfort fit Wedding Band 7.0 mm wide. The center of the ring is a matte finish and the outer edges are polished. Different finishes may be selected or specified. 18K Hand Made Hammered Wedding Band - 18K two-tone gold, comfort fit, 8.0mm wide, center hammered, hand made wedding band. 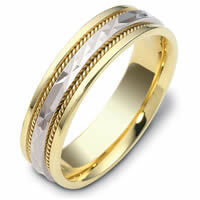 18K Two-Tone Brick-Style Classic Wedding Ring - 18kt two-tone gold, brick-style, classic, 8mm, comfort fit wedding ring. 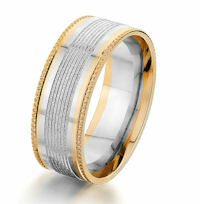 The center is made with white gold with a brush finish and the edges are yellow gold with a polished finish. Other finishes may be selected or specified. The ring is 8.0 mm wide. 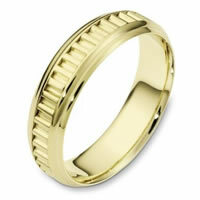 18K Two Tone Gold Wedding Band - 18K two tone gold, 6.0 mm wide, comfort fit wedding band. The finish on the ring is polished. Other finishes may be selected or specified. 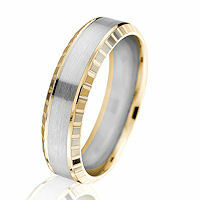 18K Two Tone Wedding Band - 18K two tone, 5.0mm wide, comfort fit wedding band. 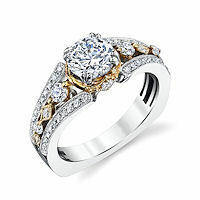 Two-Tone Diamond Engagement Ring - 18kt two-tone gold, diamond engagement ring. There are about 70 round brilliant cut diamonds set in the ring and around the crown. The diamonds are about 0.41 ct tw, VS1-2 in clarity and G-H in color. Center stone is sold separately and in other sizes. Pictured is a 1.0 carat diamond. 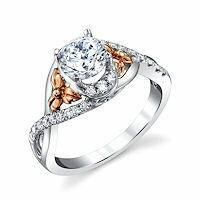 Rose & White Gold Diamond Engagement Ring - 18kt rose & white gold, diamond engagement ring. There are about 36 round brilliant cut diamonds set in the ring. The diamonds are about 0.20 ct tw, VS1-2 in clarity and G-H in color. Center stone is sold separately and in different sizes. Pictured is a 1.0 carat diamond. 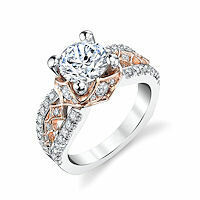 Rose & White Gold Diamond Engagement Ring - 18kt rose and white gold, diamond engagement ring. There are about 24 round brilliant cut diamonds set in the ring. The diamonds are about 0.29 ct tw, VS1-2 in clarity and G-H in color. Center stone is sold separately and in different sizes. Pictured is a 1.0 carat diamond. 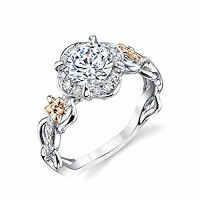 Rose & White Gold Diamond Engagement Ring - 18kt rose and white gold, diamond engagement ring. There are about 48 round brilliant cut diamonds set in the ring. The diamonds are about 0.70 ct tw, VS1-2 in clarity and G-H in color. Center stone is sold separately and in different sizes. Pictured is a 1.50 carat diamond. 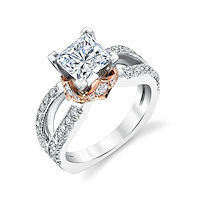 18K Rose & White Gold Engagement Ring - 18kt rose & white gold, diamond engagement ring. There are about 48 round brilliant cut diamonds set in the ring. The diamonds are about 0.35 ct tw, VS1-2 in clarity and G-H in color. Center stone is sold separately and in different sizes. Pictured is a 1.50 carat diamond. 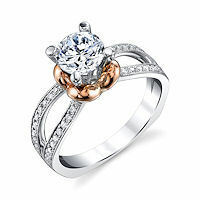 Rose & White Gold Diamond Engagement Ring - 18kt rose & white gold, diamond engagement ring. 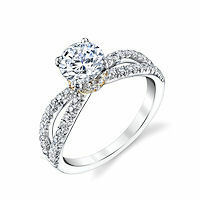 There are about 48 round brilliant cut diamonds set in the ring and around the center stone. The diamonds are about 0.70 ct tw, VS1-2 in clarity and G-H in color. Center stone is sold separately and in different sizes. Pictured is a 1.0 carat diamond. 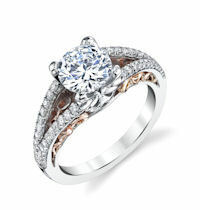 Two-Tone Engagement Ring - 18kt two-tone, milgrain, diamond engagement ring. There are about 54 round brilliant cut diamonds set in the ring. The diamonds are about 0.46 ct tw, VS1-2 in clarity and G-H in color. Center stone is sold separately and in different sizes. Pictured is a 1.0 carat diamond. 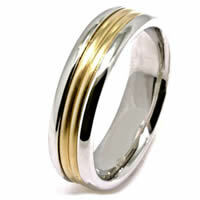 18kt Hand Made two-tone Gold Wedding Band - 18 kt Hand made Two Tone Comfort Fit Ring 7.0 mm Wide. The center is a brush finish and the outer edges are polished. Different finishes may be selected or specified. 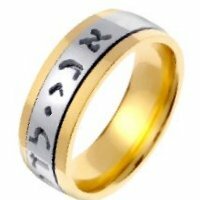 Religious Wedding Band - 18K two-tone gold, 7.5mm wide, comfort fit, wedding band. The wedding band is Song of Solomon 6:3 etched in the center in Hebrew. "I am my beloved's, and my beloved is mine". 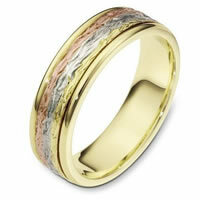 14K Tri-Color Gold Comfort Fit 5.5mm Wedding Ring - 14 kt tri-color hand made comfort fit Wedding Band 5.5 mm wide. The ring has a hand made pattern in the center with a brush finish. The edges are polished. Different finishes may be selected or specified. 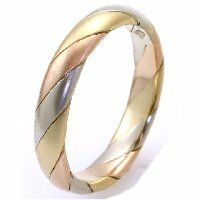 18K Two-Tone Gold 6.0 MM Beveled Wedding Ring - 18kt two-tone gold, beveled and designed, comfort fit 6.0 mm wide wedding ring. 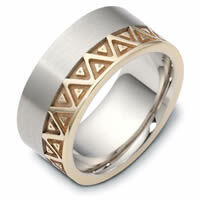 The center is in white gold with a brushed finish and the edges are beveled in yellow gold with a designed pattern. Other finishes may be selected or specified. The ring is 6.0 mm wide. 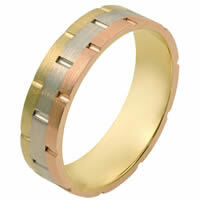 18K Two-Tone Brick Style Wedding Ring - 18kt two-tone gold, brick design, 8.0 mm wide, comfort fit wedding band. The ring is all polished. Other finishes may be selected or specified. 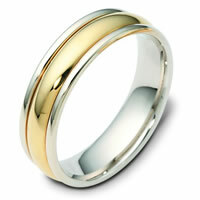 Two-Tone Classic Wedding Ring - 18kt Two-tone gold classic, comfort fit, 8.0mm wide wedding band. The ring has a mix of hand crafted and classic styles. There are two ropes beauitfully handcrafted. The center of the ring has a matte finish and the rest of the ring has a polished finish. Different finishes may be selected or specified. 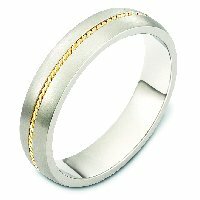 18K Two-Tone Gold Hammered Milgrain Wedding Ring - 18kt two-tone gold, hammered with milgrain, comfort fit, 8.0 mm wide wedding band. The center is in white gold with a hammered brushed finish. There are milgrains next to the white gold. The edges are made in yellow gold with a polished finish. Other finishes may be selected or specified. The ring is 8.0 mm wide. 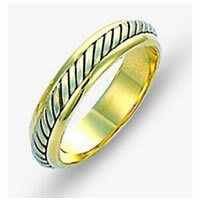 18K Two-Tone Gold Designed 8.0 MM Wedding Ring - 18kt two-tone gold, 8.0 mm wide, carved & designed, comfort fit wedding ring. 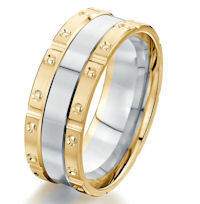 The ring is made up of white gold and yellow gold with a mix of finishes. The edges of the ring have a pattern around the whole ring. The ring is 8.0 mm wide. 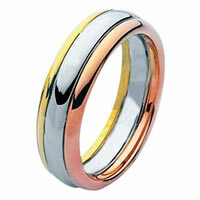 18Kt Two-Tone Wedding Ring - 18kt two-tone gold, 8.0 mm wide, comfort fit wedding ring. 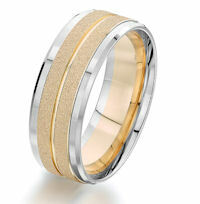 The center of the ring is yellow gold with a sandblast finish and the edges are white gold with a polished finish. Other finishes may be selected or specified. The ring is 8.0 mm wide. 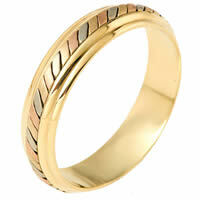 14K Tri-Color Gold Comfort Fit 6mm Wedding Band - 14 kt tri-tone hand made comfort fit Wedding Band 6.0 mm wide. The ring has a beautiful pattern in the center with a polished finish. Different finishes may be selected or specified. 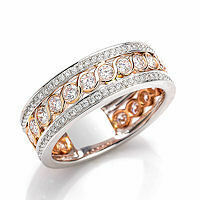 18 Kt Rose and White Gold Wedding Band - 18Kt Rose and white gold wedding band. The ring is about 5.5 mm wide and comfort fit. One portion of the ring is matte and the other is polished. Different finishes may be selected or specified. 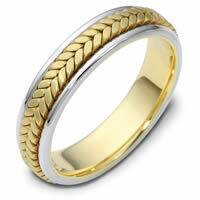 14K Gold Comfort Fit, 5.0mm Wide Wedding Band - 14 kt tri-tone hand made comfort fit Wedding Band 5.0 mm wide. There are carved notches around the whole ring. The ring is a matte finish. Different finishes may be selected or specified. 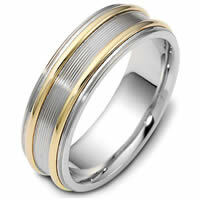 18K Gold Comfort Fit, 8.0mm Wide Wedding Band - 18 kt two-tone hand made comfort fit Wedding Band 8.0 mm wide. The center portion of the band is a matte finish. The rest of the ring is polished. Different finishes may be selected or specified. 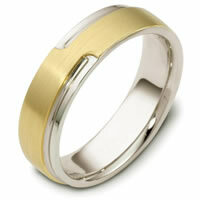 Two-Tone Gold Comfort Fit Wedding Band - 18 kt hand made comfort fit, 5.0 mm wide wedding band. The ring has a handmade braid in the center with a brush finish. The edges are polished. Different finishes may be selected or specified. 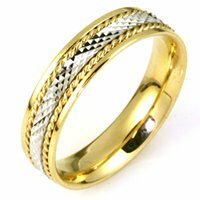 18K Hand Made 7.0mm Wide, Comfort Fit Wedding Band - 18 kt two-tone hand made comfort fit Wedding Band 7.0 mm wide. There are carved lines in the center with a polished finish. The raised portion and outer edges are polished. Different finishes may be selected or specified. 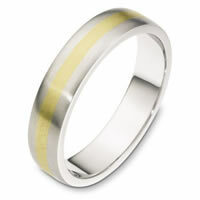 18 Kt Two-Tone Wedding Band - 18 Kt Two-Tone wedding band, 7.5 mm wide, comfort fit wedding band. The ring has two hand made ropes on each side of the band. The center of the ring is matte and the ropes are polished. Other finishes may be selected or specified. 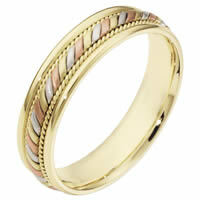 14 Kt Tri-Color Wedding Band - 14Kt Tri-color wedding band. The ring is about 7.0 mm wide and comfort fit. The whole ring is polished. Different finishes may be selected or specified. 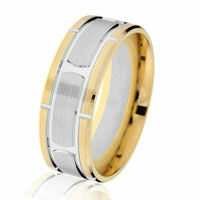 18K Two-Tone Wedding Band. 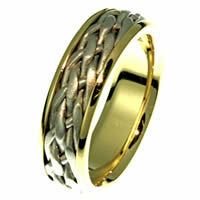 - 18K white gold with yellow gold twisted wire, 7.5 mm wide, hand made, comfort fit wedding band. There are two hand made ropes in the band. The finish on the ring is matte. Other finishes may be selected or specified. 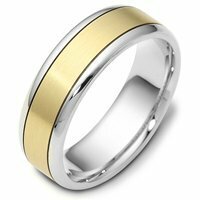 18K Gold 6.0mm Wide, Comfort Fit Wedding Band - 18 kt two-tone hand made comfort fit Wedding Band 6.0 mm wide. Sides are Brushed center part is Matte. Different finishes may be selected or specifed. 18K Gold, Comfort Fit, 7.5mm Wide Wedding Band - 18 kt two-tone hand made comfort fit Wedding Band 7.5 mm wide. The ring is a brush finish. Different finishes may be selected or specified. 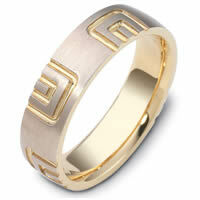 Two-Tone Carved Wedding Ring - 18kt Two-tone gold carved, comfort fit, 6.0mm wide wedding band. The ring has a carved pattern all around the ring. It is 6.0mm wide and comfort fit. 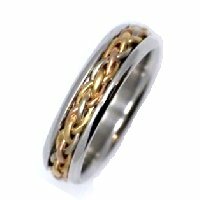 18K Gold, Comfort Fit, 4.0mm Wide Wedding Band - 18 kt two-tone hand made comfort fit Wedding Band 4.0 mm wide. The center of the ring is a matte finish and the outer edges are polished. 18K Gold Comfort Fit, 6.0mm Wide Wedding Band - 18 kt yellow gold hand made comfort fit Wedding Band 6.0 mm wide. The ring has a hand made patter in the center. The ring has a polished finish. Different finishes may be selected. 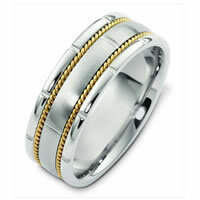 Two-Tone Gold Comfort Fit Wedding Band - 18 kt two-tone hand made comfort fit, 8.0 mm wide wedding band. The ring has two different handmade patterns in the ring, a hand made rope and hand made spring designs. The ring has a polished finish. Different finishes may be selected or specified. 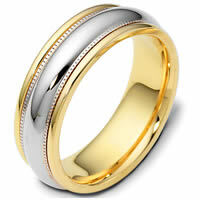 Wedding Ring - 18 kt two-tone gold hand made comfort fit Wedding Band 5.0 mm wide. The finish on the ring is matte. Other finishes may be selected or specified. 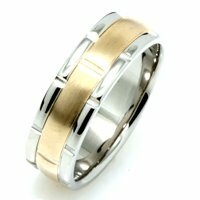 Two-Tone Gold Comfort Fit Wedding Band - 18 kt two-tone hand made comfort fit Wedding Band 4.5 mm wide. The ring has a hand made rope in the center with a brush finish. The edges are polished. Different finishes may be selected or specified. 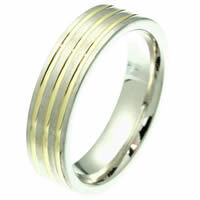 Comfort Fit, 6.5mm Wide Wedding Band - 18 kt two-tone hand made comfort fit Wedding Band 6.5 mm wide. There are carved notches around the whole ring. The ring is a matte finish. Different finishes may be selected or specified. 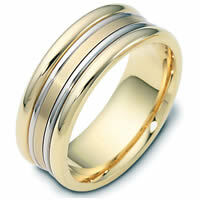 Gold Comfort Fit, 6.0mm Wide Wedding Band - 18 kt two-tone hand made comfort fit Wedding Band 6.0 mm wide. The center of the ring has a design with a handmade rope on each side. The whole ring is polished. Different finishes may be selected or specified. 14K Gold Comfort Fit, 6.5mm Wide Wedding Band - 14 kt tri-tone hand made comfort fit Wedding Band 6.5 mm wide. Three hand made patterns in the center. The whole ring is polished. Different finishes may be selected or specified. 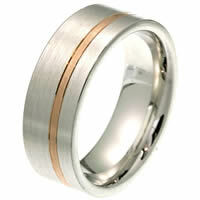 14K Gold Comfort Fit Wedding Band - 14 kt tri-color hand made comfort fit, 5.0 mm wide wedding band. The center has a beautiful handmade rope design and smaller ropes on each side. The center portion has a brush finish and the edges are polished. Different finishes may be selected or specified. 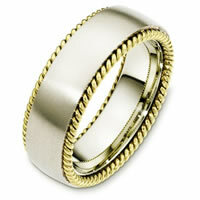 18 Kt Two-Tone Wedding Band - 18 Kt Two-tone wedding band, 6.0 mm wide, comfort fit wedding band. The band can be made with the gold colors reversed. Please request this in the comment section. The raised portion of the ring is a brushed finish and the rest is polished. Different finishes may be selected or specified. 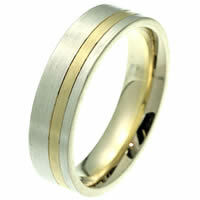 Wedding Ring, Two-Tone Gold - 18K two-tone white and yellow gold, comfort fit, hand made, 6.0 mm wide wedding ring. There is a hand made braid in the center. The whole ring is polished. Different finishes may be selected or specified. 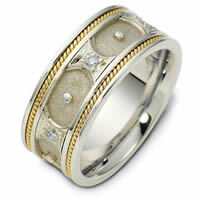 Wedding Band, 18 kt two-tone - Hand crafted, 18 kt two-tone gold comfort fit band. Two channels of 18 kt yellow gold twisted wires completes the ring. The whole ring is polished. Different finishes may be selected or specified. 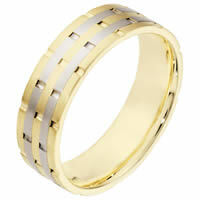 Wedding Band 18 Kt Two-Tone - 18 Kt two-tone gold, hand crafted wedding band. The ring is 6.5 mm wide and comfort fit. The center of the ring is a matte finish and the outer edges are polished. Different finishes may be selected or specified. 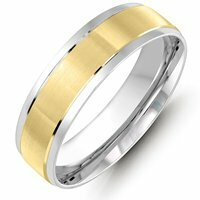 18K Gold Comfort Fit, 5.5mm Wide Wedding Band - 18 kt two-tone hand made 5.5 mm wide comfort fit, crosscut center Wedding Band. The center of the band has a crosscut design with a handmade rope on each side. The whole ring is polished. Different finishes may be selected or specified. 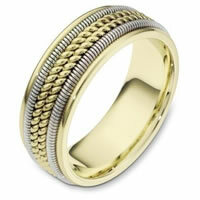 18 Kt Two-Tone Crafted Ring - Hand crafted, 18 kt two-tone gold comfort fit band. The ring has a white gold braid with yellow gold band surrounding the braids. The center is matte finish and the sides are polished. Different finishes may be selected or specified.